I woke up early Tuesday morning to the sound of chickens screaming bloody murder. I got up and thought about going out, but they eventually quieted down. The next morning one chicken was missing, a trail of blood and feathers leading through a hole that was clawed in the wire. I'm pretty sure it was raccoon. I ended up in my work clothes, pounding heavy staples into the wood to try and repair things. The chickens were still here this morning, so it worked well enough. On the plus side, the eaten one was one that wasn't laying anymore. Instead of feeding it to a human somewhere, we're supporting our local wildlife. Sam and I had our boys night yesterday and watched The Walking Dead after a ton of homework. I managed to get Duncan and Berry to bed while Joanna went to choir practice. Tonight Joanna and I have a date night. The only other exciting thing going on is that I'm thinking about taking Friday off work to hang out with Sam. He has no school that day, and a testosterone fueled gaming session sounds somewhat appealing. I can't remember such a wonderful Thanksgiving as the last few days. It was low-key and involved a tremendous amount of hanging out. The kids were at Jamie's on Wednesday night, so Joanna and I went out for a hot date. We were celebrating three years together, which started the day before Thanksgiving on the dance floor at Agate Hall on the day the dance was cancelled. We first had dinner at the Agate Street Bistro and exchanged gifts, as we decided jail food was probably lousy. Fortunately we didn't have to break any windows, as the door was open and we quietly snuck in and danced a little before leaving. I picked up the kids Thursday morning and we enjoyed the day until it was time to go to mom's for dinner. Emma played Guitar Hero, getting pretty good at it. I think Duncan and Berry kept their PJs on until it was time to leave. Emma and I went over early to help set up, with Emma staying to cook all afternoon. She was quite proud of her creamed peas. We eventually all arrived, eating and chatting our way through dinner. 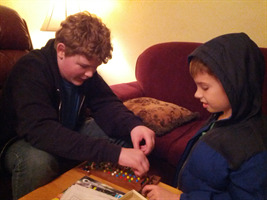 Sam and Duncan played Mastermind. Berry played with toys. Emma flitted about. I talked to my sisters on the phone. No one had a melt down and everything was pleasant. Friday morning was when we decided to celebrate Sam's birthday (his actual birthday is today). We had a delicious breakfast of crepes and sausages, followed by treats picked up at Sweet Life and Metropol. Sam got a sticky bun with a candle. He also ended up with a book, an Adventure Time Mad Lib, and Castle Panic, a boardgame. Plus he got X-Com and The Walking Dead video games. The latter he played obsessively over the next few days and declared great. Jamie texted to let me know she was sick, so I kept Sam over the weekend. I took he and Emma to Thanksgiving dinner at Dave's house. Duncan wanted to come along too, though we sadly informed him that probably wouldn't work out. Sam hung out with Josh. Emma was loved to death by Finn. I think they had a good time. The next couple days were fairly low-key. I went shopping and got pizza for Mythbusters. Joanna and I got to some tidying up, and I fixed the chicken coop's storm damage. Sam and I played a lot of video games. I got into Dark Souls, which Sam has playing obsessively for weeks. Sam also bought Crusader Kings II, with the highlight being the time we figured out how to marry off a relative to strengthen our ties with another kingdom. Sunday morning we took everyone but Sam to see The Rise of the Guardians with Jenny, Jordan, and mom. Emma loved it, and I thought the special effects were pretty good. We puttered around until it was time for Joanna and Duncan to go to Berry's ballet performance. Sam, Emma, and I ate weird dinner food, played Nerf guns in the basement, ran around playing hide-and-seek, and then got ready for bed. Now we're back at work and school, filled with pleasant memories that will hopefully sustain us until Christmas. Happy Thanksgiving everyone. We're there with you in spirit and gluttony! It was actually a pretty great weekend as weekends go. Friday night we hung out with kids and ate Tasty Thai, followed by a breakfast of pancakes in the morning. We hadn't had pancakes in ages, but Berry asked for it specifically. I think it had something to do with Curious George. I took Berry and Emma to the library while Duncan and Joanna went off to Target for a shoe shopping spree. A very grumpy Berry calmed right down and we had a great time. 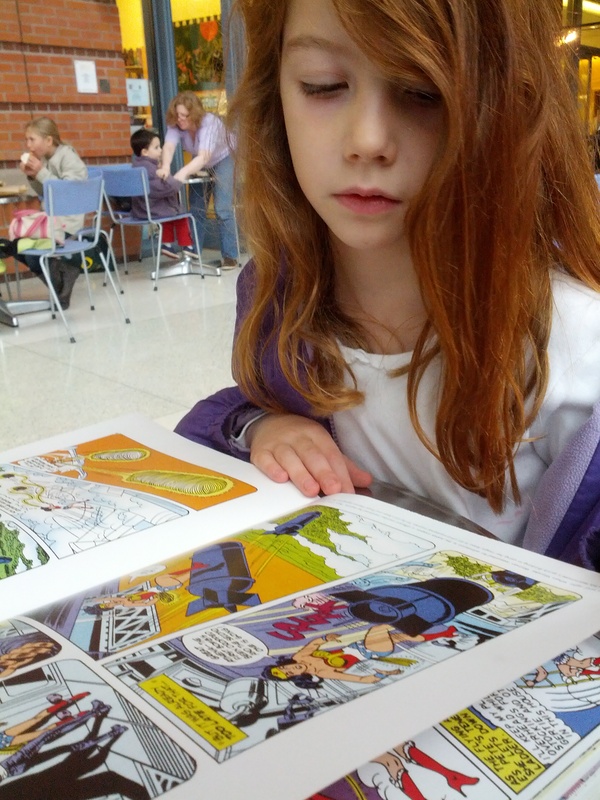 Berry was mesmerized by her Wonder Woman book. Emma read A Practical Guide to Wizardry for the tenth time. We snacked in our usual area, then wandered home for lunch. Emma was especially sweet all weekend, playing Littlest Pet Shop with Berry, joking with Sam, and playing pretend with Duncan in the basement. She even lured me downstairs to play music. I ended up banging on the drum and having a remarkably good time. Sam came home a little early after a doctor visit. I picked up endless meds for him as well as a pizza for Mythbusters. He continues to play Dark Souls more than any video game except perhaps Minecraft. Berry yanked her own tooth out on Sunday. She casually came into the living room with toilet paper stuffed into her mouth. I was a little worried she'd start in on the teeth that weren't loose in order to cash in. It's also the end of an era as Duncan had a chat with Joanna, telling her that he was pretty sure the tooth fairy wasn't real. I guess we'll see how Christmas goes. We're gearing up for Thanksgiving and Sam's Birthday. He usually seems older than his almost fourteen, mostly because he's bigger than me now. He's gotten pretty funny too. Hopefully the trend continues. We're going to visit Seraph, Robbie and Isa for Christmas! A friend posted about a Southwest Airline pre-holiday sale, one day long. Since the one day was yesterday, I scurried around and talked to Robbie and Seraph a couple of times. 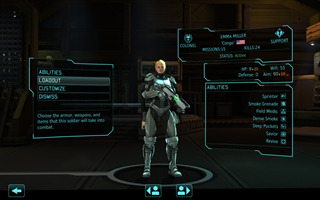 There's a new X-Com game that came out recently, a remake of the classic "fight against the alien invaders" game. There are mysterious UFOs you can shoot down, a team of crack soldiers you can advance in rank, base building, research of alien technology, and of course tactical fights against the foe themselves. I'm having an especially good time naming soldiers after various family members. 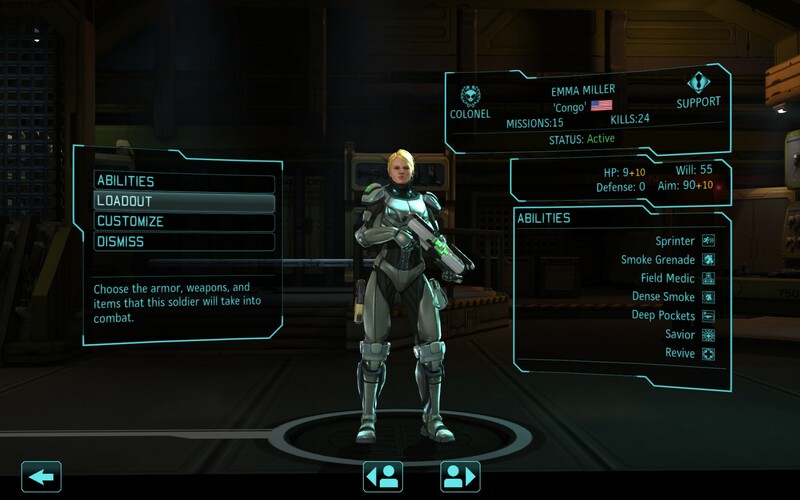 Emma ended up in a support role, especially good at tazering aliens to bring back for interrogation. Sam's a heavy, blowing up buildings with his rocket launcher. More than once he's saved my team's bacon. It looked grim for awhile, but I think things are improving. Okay, it wasn't that bad. I did seem to have endless meetings, crises, and assorted craziness. I think I managed 30 minutes of work on my projects at the very end of the day. 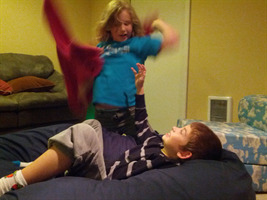 We had all the kids last night, the usual madness of homework, silliness, and emotional trauma. Emma was particularly sweet, wishing me a wonderful day as I took everyone off to work. I'm excited for the weekend - full of library trips, ballet, and Mythbusters. Work continues to be crazy. Yet more people leaving, though fortunately none from our team. I'm really swamped after taking on a lot of responsibilities from our lead who left a couple weeks ago. Everyone who walks by my cubicle wants to sit and talk. It's nice, though difficult to get things done. Life on the home front has been generally positive. 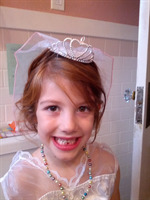 Berry was very excited to lose her tooth the other day, along with the dollar that came with it. 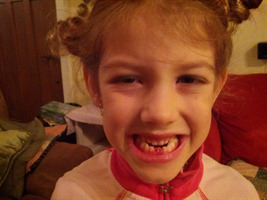 The actual tooth removal part, which she did herself, involved a lot of tears. Fortunately the excitement overcame the momentary pain and suffering. Emma made it to school after almost a week away. Whatever illness she had has finally passed. 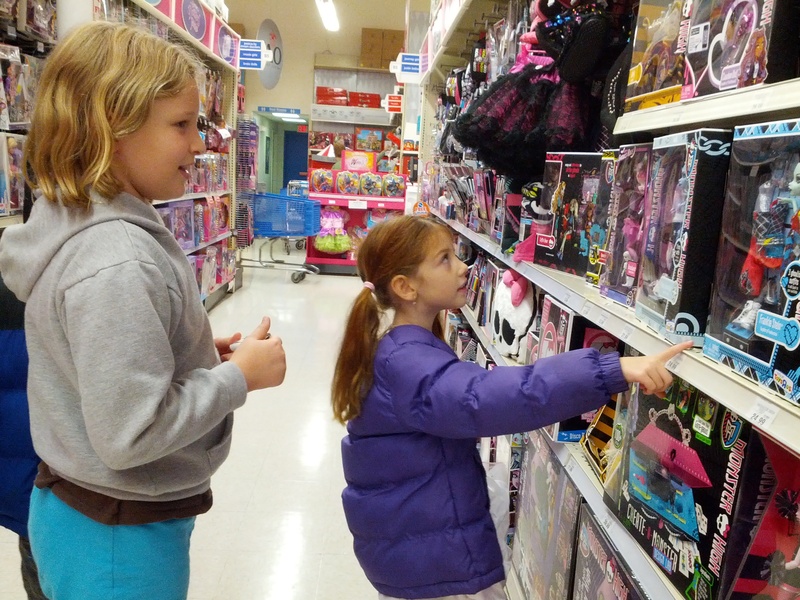 She also has a new obsession of Monster High, obtained after watching lots of Monster High YouTube videos while she was sick. She ended up blowing nearly $100 on toys over the last few days. Hopefully it sustains her with happiness and joy. The holiday madness is slowly approaching. I think we can do Thanksgiving with the kids on actual Thanksgiving. I'm also trying really hard to have all the kids Christmas morning, something that hasn't happened before. I need to start gearing up for Christmas presents too. Fortunately Joanna and I have a hot date tonight. I think we're going out to a fancy place to eat, as she's all gussied up from some work event. She even curled her hair this morning. We had a big go-live at work this morning. The best part was when things went horribly wrong and I accidentally sent out 28,000+ emails. Fortunately only a couple thousand went out and I managed to purge the rest from our email queue. The kids are out of school, and I managed to come home to hang out with them for a little. Around one, Sam and Emma are going to their mom's, with Sam returning after dinner. Haylee is coming to watch Duncan and Berry. I'm going to keep working away, trying to get things done. I did get a kinda-sorta promotion today. I'm the temporary functional lead of the developer group. There's not much of a pay increase, and I worry I won't have time to do computer programming. Hopefully I can give our team some stability in the madness ahead. The weekend was good, if uneventful. Some highlights include taking kids to Toys-R-Us, discovering a warren of small mammals under the chicken coop, and playing the new X-Com game. I think Emma is finally on the mend and may actually make it to school tomorrow. Thank you everyone for the birthday wishes! It's been a few whirlwind days of work and fun, but today is quiet. It's my first day off in a month, so I'm still in my PJ's and gearing up for some house cleaning. Love you all! A card and small present have been wending their way to you. We all miss you! I'm getting really senile and almost forgot. Ana, with her younger brain reminded me. Have a great day. I'm generally okay, but Emma's home from school and Berry and Sam have a persistent cough. Joanna and I are working from home and Duncan has the day off for parent-teacher conferences. It's a quirky day. I worked from home yesterday as well, getting a tremendous amount of work done and hanging out with no-school Duncan. I dropped off Berry this morning, giving her plenty of jumpies, and then swung by Full City for my delicious Friday mocha. Tonight is date night, though I'm not quite sure what we're up to. I suppose I could holler across the room to find out. We stumbled to work and school this morning. It was nice having the extra hour, though it felt that we needed it to some degree. Emma in particular was moaning and groaning from over an hour playing Wii Fit on Sunday. I think she'll survive. The weekend was generally productive. Friday night Joanna and I went out, listening to English folk music at the library and then off to vegetarian Chinese food. Saturday morning I hooked up a second security camera, much to the amusement of the kids. Later that night, Sam and I tried to sneak by them in the dark, which didnt' work very well. In the afternoon I took the girls to the library. The evening wound up with pizza and Mythbusters. Sunday was pretty busy, with the little kids going to a couple birthday parties. Duncan really had fun at Splash. I managed to get Sam through his homework, which ended up being pretty tedious. Hopefully he's caught up from when he was sick. I took Sam and Emma for a walk that afternoon. Otherwise we hung out, with Emma playing Wii Fit for hours. My mom, Yayoe, and John came for dinner, which was exceptionally tasty. Busy today, my mocha fueling me forward through the work madness. There's so much work to do, and so many organizationally weird distractions. 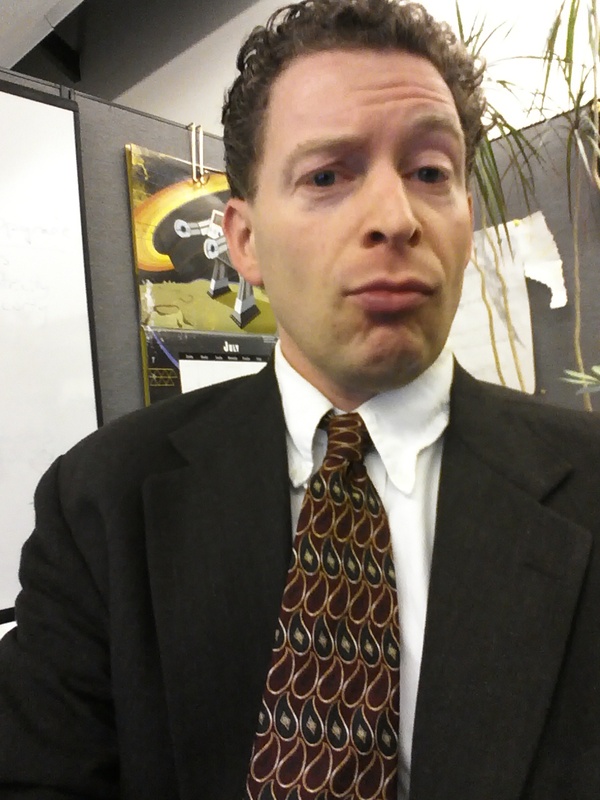 I had lots of fun on Halloween, going as a job applicant. I ended up winning the department's costume party, I mostly because I put together a fake resume that I handed out. Of course, it's all true. We took Emma and Berry out trick-or-treating. We hit the main houses, and then Berry and Joanna went out again to return with a huge pile of candy. Berry sat there and kept eating while Joanna went to fetch Duncan from his party. I think Berry didn't really want it towards the end, but felt obligated to try. Jamie and I had our parent-teacher conferences for Emma on Thursday. Emma is adored by her teacher. She's doing well in everything, with the recognition that Emma's spelling is pretty marginal. On the plus side she's started to read and write lots more this year, so hopefully it's a self-correcting issue. Emma strangely rated herself as poor in math, even though she's doing great (and Sam was successfully teaching her Algebra the other day). Sam's been slowly catching up with his homework. We made Fimo and magnet molecular models last night, showing off ionic bonding. I also picked up a 2-pack of Orcs Must Die 2 and we've been playing co-op together. Great fun. Looking forward to the weekend. Joanna and I are going out for dinner due to the Wednesday Halloween festivities. No big plans, except perhaps to clean the minivan. I suspect someone's having a birthday party - they seem endless.